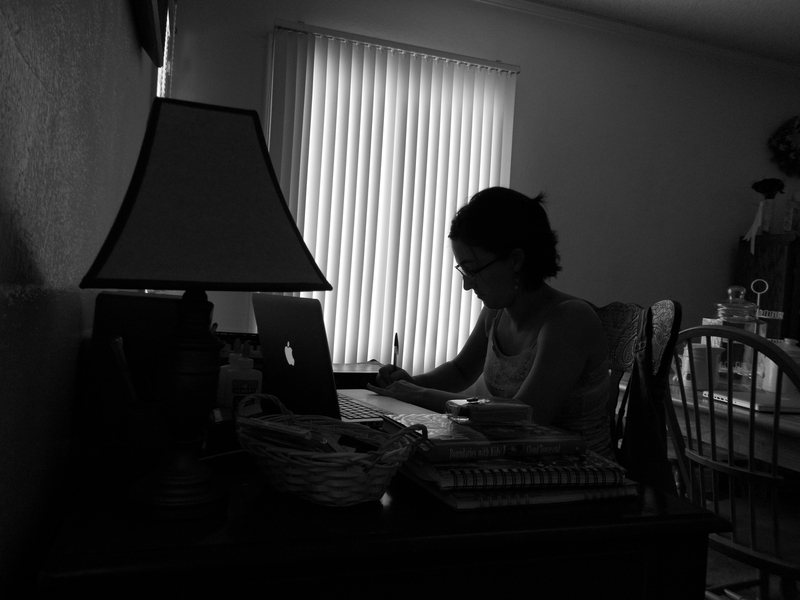 My husband, Kristopher, caught a photo of me writing in the late afternoon a few weeks ago. This is my desk. This is my pen. This is my computer. This is my journey. I spent the late part of the afternoon today reading through old journals. In the beginning parts of my journey to become a published author, I have been exploring old writings. In some ways this has been good, as I remember the ways in which God has blessed and sustained us through the years. But in other ways, it has been slightly depressing. For starters, I used to be a terrible writer. I like to think that my writing has improved through the years, but perhaps more so it has been the growth and transformation in my heart. In early journals I was a young wife, a young mother, and foolish. Years later, I’m still foolish, but not as young, and I believe this has impacted my writing style. I also found myself depressed by the lack of writing. In years past, instead of elaborating in written word the excitement and joy of an event or special occasion, I simply wrote down what happened. Example? We are pregnant. I’m so excited. That’s it. That’s all I got. Are you serious? Our whole world was being shaken and this is all I wrote?! Sadly enough, yes. My thought at the time was that it is better to write at least a few words each moment or each day so as to record our lives, rather than miss out completely on writing because I didn’t have time to elaborate. And yet, years later, while I am thankful for a few words, I now have little to draw from. So, maybe writings of the past will not be as helpful as I intended. But I will continue on the journey. The words may not have been present long ago, but the emotion was. The lessons learned and the joys experienced are still vibrant in my heart, and I am thankful to the Lord that he has rekindled the memories in the my heart and a passion to tell their story. I’ve started reading some really helpful writing encouragement from http://goinswriter.com. you might check it out.